Jon Court (photo via Youtube). 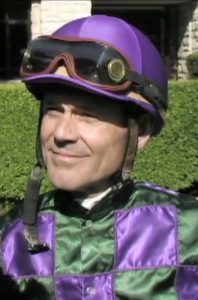 When the starting gate opens for the $1 million Arkansas Derby (GI) at Oaklawn Park on Saturday, 58-year-old jockey Jon Court will be aboard Long Range Toddy, the 5-1 third choice behind — who else? — trainer Bob Baffert’s Improbable. A solid effort by the Ellis Horton-owned Long Range Toddy (he’s already Derby qualified with 53.5 points), and it’s off to Churchill Downs for the $3 million Kentucky Derby (GI) in three weeks. Court expects to be there too, and when the gates spring open, he’ll become the oldest rider to compete in 145 editions of the world’s most famous race. Does age matter? 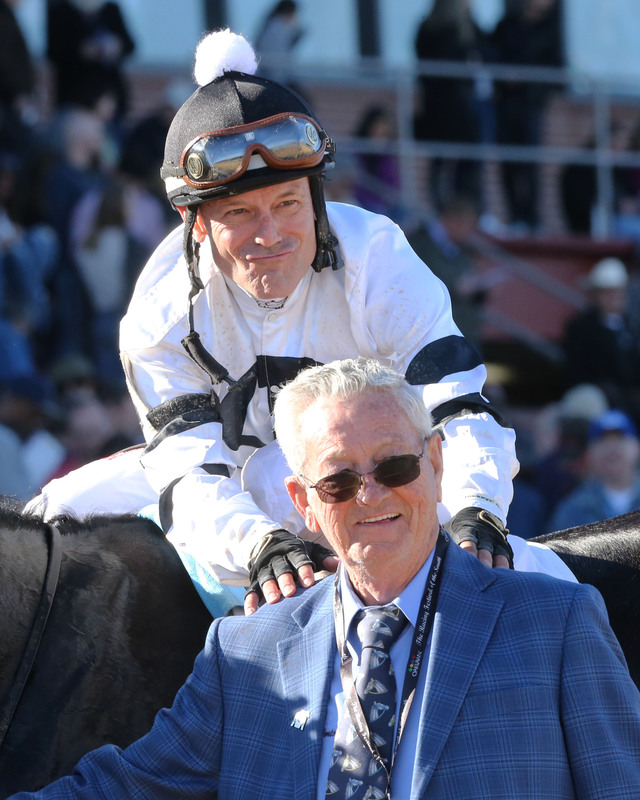 After all, didn’t Mike Smith, at 52, become the second oldest jockey (behind Bill Shoemaker, 54) to win the Derby last year aboard Justify? And then go on and become a Triple Crown winner? This would be just the fourth Derby trip for one of the more well-respected riders in the business, all of which have occurred since 2011, when Court was a mere youth of 49. Jon Court will ride Long Range Toddy in the Arkansas Derby (photo via Oaklawn Park). His former father-in-law, trainer William ‘Jinks’ Fires, was the person who gave Court his first Derby starter in Archarcharch, a horse who won the Arkansas Derby before finishing 15th in the Kentucky Derby while suffering a career-ending injury. Court has learned to accept the bumps in a career that has earned him numerous riding titles on the Midwest circuit, mostly in Arkansas, Kentucky and Indiana. He’s also ridden in Louisiana and California. He tries not to take home tough losses, or when he’s replaced by another rider for a big race, even though he’s won a share of his own — but he’s never hit the board in six Triple Crown races: three Derbies, two Belmont Stakes and one Preakness. Court, born in Gainesville, Florida, was an early starter. He knew he wanted to be a jockey way back in elementary school. In 1980, when he was 19 years old, he “swung a leg over” Neva’s Hope in his first thoroughbred race at Centennial and Neva’s Hope ran second in a $2,200 claimer. Seventeen days later, on June 7, Court scored his first career win — with Neva’s Hope, in a $2,300 claimer. The race to the dream was on, but it took a bit longer than many expected. Although he’s ridden some top horses, such as Wise Dan, Leroidesanimaux, Will Take Charge, Archarcharch, Fleetstreet Dancer, Nite Light and Perfect Drift — and has won more than 4,000 races — it wasn’t until Fires and Court teamed up with Archarcharch that the Derby became reality. Court was the regular rider for the horse, who won the Southwest Stakes and Arkansas Derby before moving on to Louisville. As sometimes happens, though, the best laid plans can fall apart in an instant. Leaving the starting gate, from the No. 1 post position, Court never had a chance as Archarcharch stumbled in the first few steps, then clipped heels with another horse and dropped out of contention. Archarcharch had actually fractured his left front leg, yet finished ahead of four other horses. He was vanned off, had surgery to repair the leg and was retired from racing. Court, who has to be one of the most positive people in an industry under tons of scrutiny, was disheartened, but now takes it all in stride. He’s won on horses he figured were Derby-bound, but for various reasons, an owner or trainer went another way. Hall of Fame trainer D. Wayne Lukas gave Court his other two Derby starts, Optimizer, 11th in 2012, and Will Take Charge, eighth in 2013. Two weeks later, when Preakness time rolled around, Lukas replaced Court with Corey Nakatani on Optimizer, and with Mike Smith on Will Take Charge. In 2010, Court rode Line of David to a thrilling neck victory over Super Saver in the Arkansas Derby, then watched as Rafael Bejarano replaced him for the Kentucky Derby and finished 18th behind the winner, Super Saver. Even though Bejarano had been aboard Line of David before, and Court somewhat expected the change, it did not sit well with his fans. “It was an exciting experience to ride Line of David, but I kind of knew that I might not be able to get to ride him,’’ said Court, alluding to the fact Bejarano had won two previous races aboard the colt at Santa Anita. “I just know that there was a big following in a Facebook page about keeping me on the horse. And I just really wanted to squelch that because I knew and understood. “But the general public were pulling for me and that was really nice on their part that I had such a strong fan base, that they’d put up a Facebook page and a lot of people commented. Court has had his share of injuries; a broken wrist, some broken ribs and three broken vertebrae. Off the track, he broke a bone in his shoulder when his Harley Davidson slid out from under him, and broke some ribs while riding a raft in a wake behind a boat. He says he’s in the best shape of his life, and has no plans to retire. “I’d like to be able to enjoy this industry as much as I have loved it, and be able to step down gracefully at my timing,’’ said Court. As for Saturday, Long Range Toddy comes into the race after defeating Improbable by a neck in the first division of the Rebel Stakes (GII) at Oaklawn. It was Court’s first trip aboard Long Range Toddy. “Jon gave him a beautiful trip and I love how he earned it late,” said Steve Asmussen. As Court might say, better late than never when it comes to the Kentucky Derby.